In this season of thankfulness, I am most grateful for my God, my family, and my country. Most of us are. Still, I would like to pay special homage to some great mentors that I have had. I have been blessed with many, many mentors. So many have been influential over my life and career that I dare not name names, as I will certainly miss someone. But, I have three mentors that have been very influential in my career and many others in the forage-based livestock industry can also identify with as mentors. Those individuals are Drs. Don Ball (Auburn University), Carl Hoveland (University of Georgia), and Garry Lacefield (University of Kentucky; listed left to right in the picture below). 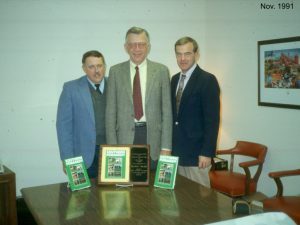 In November of 1991, these forage experts formally announced the release of Southern Forages, a practical guide to forage management published by the Potash & Phosphate Institute (now known as the International Plant Nutrition Institute). With the publication of their book, Carl, Garry, and Don created one of the most important reference books for our industry. I would dare say that there are more copies of Southern Forages in the pickup trucks of our farmers, the bookshelves of our County Extension Agents, and on the desk of more students than any other book on forage management. With over 100,000 copies sold and its use as a textbook in over 60 universities/colleges, Southern Forages has been a resounding success. In the summer of 1995, between my sophomore and junior years at Berea College, I did an internship with Drs. Garry Lacefield and Monroe Rasnake at UK’s West Kentucky Research and Education Center. It was there that I was “bit by the Forage bug” and where I received an autographed copy of Southern Forages. That experience left such an impression on me that I chose that as my career. In fact, I had decided I wanted to be at Auburn University, University of Georgia, or University of Kentucky when I finally landed some where. That dream came true 12 years ago this month. As I started my career at UGA, each became more than an author of that textbook. They became my mentors and friends. And better mentors and friends, one cannot imagine. And then, earlier this month, I had the pleasure of recognizing each of these gentlemen and scholars as “Giants of Agriculture” in a session at the Crop Science Society of America’s annual meeting in Baltimore. It was one of the highlights of my career thus far. I also had the opportunity to interview each of the three men, asking them about their careers and life’s work, as well as their families. For those in the forage world, or in any scientific endeavor for that matter, I think you might enjoy some insight on how these gentlemen achieved so much and balanced life with it. In this season of thankfulness, consider those about you that have lit your path, guided you along the way, and provided you with wise counsel. From my household to yours, may you have the happiest of Thanksgivings.